Robert Carman is the Food Services Director at Heart of Texas Camp & Retreat. As the chef of the camp, he oversees the daily planning and supervision of the dining hall operations. He plans each meal with the campers in mind to reach for the highest quality. 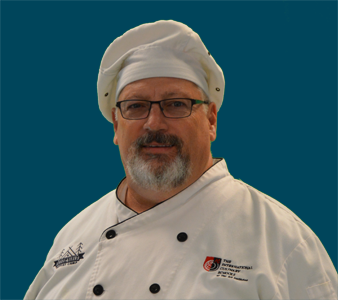 Robert holds an Associates of Science in Culinary Arts from the Arts Institute of Charleston, South Carolina. Robert joined the team in May 2018, after serving at camp as a volunteer in April 2018. Robert is a graduate from Wink High School, Community College of the Air Force, Arts Institute of Charleston, and ITT. He served in the Air Force for 23 plus years. He has been married to Shana Carman for over 30 years and they have 3 children and 2 grandchildren. Robert has always felt the drive to serve others in anyway he can. After retiring from the Air Force, he and his wife found a great way to serve through RV ministries. What he did not realize was God was preparing him to serve in another compacity as chef at our camp. Robert has many talents, including pencil drawings, caricature drawings, computer graphics, and an extensive knowledge of computers. He also loves the outdoors.